Every fall, polar bears near Churchill, Manitoba prepare for their annual migration. Some have been stranded on land all summer and fall, unable to access their favorite meal of ringed seals. Once the melted ice re-forms, the bears can return to their seal-hunting grounds where, catching ringed seals from the proximity of the floating ice, they can gorge themselves on as much as 100 pounds of blubber at a time. 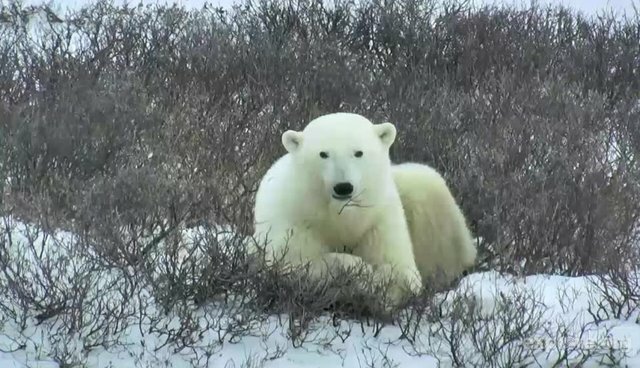 What you are watching: Take a virtual field trip aboard a "Tundra Buggy" with Polar Bears International and Frontiers North Adventures. As the polar bears wait to return to their hunting grounds, expect lots of napping and foraging in the snow. Best viewing hours: 9:30 a.m. – 4:00 p.m. (Central Time). If the video is not live, click here to view other Explore.org livestreams. To learn more, visit Explore.org and click here to support Polar Bears International. CLARIFICATION: A previous version of this post suggested that the polar bears are emerging from hibernation. While pregnant females spend winter in snow dens, not all polar bears hibernate.